The digital streaming music market is driving content consumption across Southeast Asia and advertising based services are climbing the charts. Effective Measure’s latest poll of key Southeast Asia markets reveals that while consumption of streaming music services is accelerating, music lovers are reticent to part with money, suggesting that ad supported services have promising room for growth. 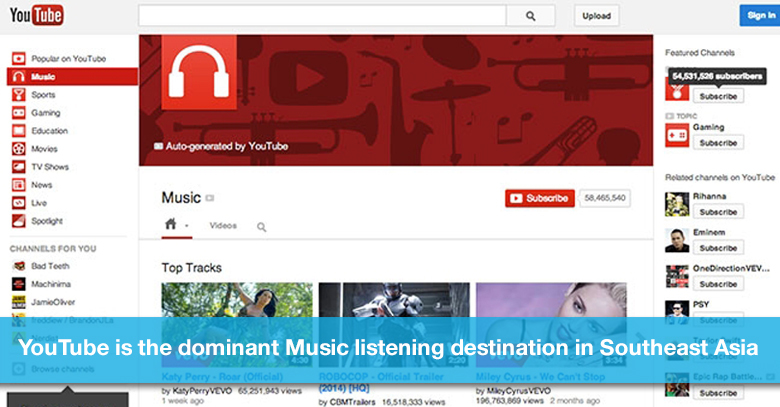 Research conducted by Effective Measure, the leading emerging markets provider of media planning and audience profiling solutions found that YouTube is the dominant listening destination. Southeast Asian digital audiences users surveyed revealed they were equally likely to listen to music on YouTube or an app that streams music from YouTube (78%) as they were to listen to music on FM radio (70%). While the majority of respondents said that they were not prepared to pay for their music services, those users that currently spend more than 20 minutes a day listening to their own choice of music are more than twice as likely to pay USD$30 per year for a streaming music service that promises no ads, great sound quality, a great app, and a huge selection of music that suits their tastes. Currently one in six (17%) of those surveyed have an active subscription to a streaming music service that they pay for. The issue of piracy is also lessening as a barrier to entry with roughly half of consumers surveyed stating that recording artists are less troubled by music piracy now than in the past. The Effective Measure survey also found that digital music users place great sound quality (42%) as the most important feature in a streaming music service, following by no ads (25%) and a wide selection of music (21%). “Southeast Asia’s high speed network connectivity and escalating mobile penetration makes the music streaming model seamless to use for consumers and provides a ripe platform for brands to engage with. Being able to monitor advertising engagement across these new platforms is crucial,” added Robertson.